Adams PRODUCED BY A Patchwork of History and Nature. 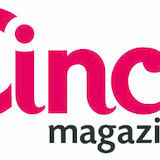 14633 State Route 41, West Union N38.813697 W083.52222 OHIO DEPARTMENT OF NATURAL RESOURCES 2045 Morse Rd. Bldg C-4, Columbus, OH 43229 (614) 265-6561 • ohiostateparks@dnr.state.oh.us ADAMS LAKE STATE PARK Paved Walking Path – .5 mile This one-half mile paved trail is flat and easy walking as it follows the shore of Adams Lake, originally built as a water source for the village of West Union in 1947. The path is wheelchair and stroller accessible and is quite popular with those who regularly walk for exercise. This small lake is also a great place to watch for waterfowl during migration. ADAMS LAKE PRAIRIE STATE NATURE PRESERVE Post Oak Trail – .3 mile This short shady loop explores the oak-hickory forest once common in this area. Notice the understory is populated not with oaks, but with young maples—a result of our forests changing in response to modern land-use and absence of wildfire. If you hike quietly, you may see gray squirrels or white-tailed deer and as they forage in the woods. Prairie Dock Trail - .2 mile A very short, easy loop passes through sparsely vegetated xeric, or dry, prairie situated on a highly eroded slope of calcareous Estill Shale surrounded by a second-growth oak-hickory woodland. Red cedar, post oak and blackjack oak occur sporadically in the prairie opening. Prairie grasses are sparse but Adams Lake Prairie supports diverse prairie forbs including a stand of prairie dock. Some of the interesting plants found growing at this cedar barren prairie include spider milkweed, shooting-star, green milkweed, Carolina buckthorn, American aloe, slender blazing-star and large summer bluets. ARC OF APPALACHIA PRESERVE SYSTEM 7660 Cave Road, Bainbridge, OH 45612 (937) 365-1935 • info@arcofappalachia.org Crawdad Creek Trail – 1.2 miles Crawdad Creek is a verdant dolomite stream valley bordered by 40-foot vertical rock walls. It is rich in spring wildflowers and very scenic geologically. Due to its location south of the glacial boundary, the forests have a prairie influence, and many prairie wildflowers persist under the shade of the forest canopy. The water quality of the streams rates among the cleanest headwater streams in all of Ohio. Early Buttercup Trail – 1 mile The Early Buttercup Trail follows a verdant dolomite stream valley that has created a gentle valley on the western portion of the preserve—a separate stream from Crawdad Creek. This is the best trail to admire spring wildflowers in midApril, and the early showcase of the rare snow trilliums that bloom in mid to late March. The water quality of the streams rates among the cleanest headwater streams in all of Ohio, harboring a high diversity of invertebrates and fish for its small size. Golden Meadows Trail – 1 mile The Golden Meadows Trail is a pleasant walk through a sunny meadow that has established itself on land that was managed as an agricultural field by the previous owner. The meadow spreads across a wide swale and affords aesthetic views of the higher elevation forests that embrace Chalet Nivale to the north. OHIO DEPARTMENT OF NATURAL RESOURCES 2045 Morse Rd. Building C-4, Columbus, OH 43229 (614) 265-6561 • ohiostateparks@dnr.state.oh.us Four interconnecting hiking trails can be found at Chaparral Prairie as well as a number of well-maintained firebreaks, which may also be explored by the visitor. This is an outstanding xeric limestone prairie with post and blackjack oaks. It supports the most extensive population of rattlesnake master in the state. Prairie dock and spiked blazing star are also unusually abundant at this site. Eleven state-listed species have been recorded at the preserve including spider milkweed, prairie false indigo, pink milkwort and American bluehearts. Little bluestem is the dominant prairie grass. Chaparral Prairie is an excellent place to enjoy butterflies during the summer months. Uncommon species such as Edward’s hairstreak and the olive hairstreak have been Photo by: Martin McAllister observed here. OHIO DEPARTMENT OF NATURAL RESOURCES 2045 Morse Rd. Building C-4, Columbus, OH 43229 (614) 265-6561 • ohiostateparks@dnr.state.oh.us Agave Ridge Trail - .5 mile This short, easy loop gets its name from a rare plant species once much more common here in the early 20th century. Agave virginica (now Manfreda virginica) is more commonly known as American aloe. Its prevalence in this area Photo by: Michael Gossett prompted the renowned botanist Dr. E. Lucy Braun (1889-1971) to name this low ridge after this unusual plant. The plant communities have changed considerably since Dr. Braun conducted research here and the area is now mostly forested. A geologic fault is visible where the trail passes close to Cedar Fork, a tributary to Scioto Brush Creek. Sullivantia Loop - .5 mile This half-mile loop treats the visitor to a great diversity of native flora as well as interesting geological formations. Passing through the floodplain of Cedar Fork, along vertical dolomite cliffs and dry oak ridgetops, provides the visitor with the opportunity to see many species of native plants. The endangered Walter’s violet occurs along this trail as does tall larkspur and the trail’s namesake, Sullivantia. Use caution as the trial passes near the cliff edge in places. Trailside interpretive signs help visitors understand the local ecology. Buckeye Trail The Buckeye Trail, a 1,400-mile hiking trail, which follows backroads, canal towpaths, old railroads and forested trails, passes through Davis Memorial State Nature Preserve and briefly follows both the Agave Ridge Trail and the Sullivantia Loop before crossing onto private property as it makes its way toward Mineral Springs Lake. It is NOT a local loop and does not return to the parking area. OHIO DEPARTMENT OF NATURAL RESOURCES 2045 Morse Rd. Building C-4, Columbus, OH 43229 (614) 265-6561 • ohiostateparks@dnr.state.oh.us Snakeroot Trail – 1.2 miles Second-growth oak-hickory woods, impressive stands of tuliptree (or “yellow poplar”) and deep ravines comprise most of this preserve. Enjoy the open woods along sections of the trail, a site you don’t see much. This is due to the deep shade and the lack of invasive species. The most interesting sections are the prairie barren openings dominated by blackjack and post oaks. Some of the more significant species present in the prairie barren openings along Unity Road include green milkweed, spider milkweed, prairie false indigo, large summer bluets, false scurf-pea, Carolina buckthorn and few-flowered nutrush. This area, like many others in Adams County, has had a long recovery following a period in the early 20th century when the land was denuded of trees and nearly useless for agriculture due to serious erosion. This little-known trail is great for birding in the spring. The trails in Shawnee State Park range in difficulty from an easy 3/4-mile walk along the lake trail to the more challenging 2-mile Lookout Trail, which affords a wonderful view of Roosevelt Lake and the surrounding forest. A short 1/2-mile ADA compliant trial behind the nature center circles through Hemlock trees in a cool moist ravine along Turkey Creek and has interpretive tree signs. The Knighton Trail also has interpretive signs sharing our rich natural history and was named for local mycologist Harry Knighton, who started the North American Mycological Association. 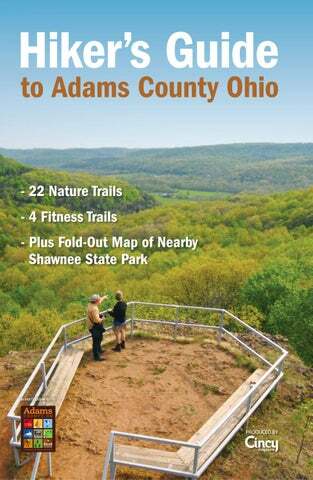 For the more adventurous, the nearby Shawnee Day Hike trial offers 4 and 7-mile loop options and for the backpacker, the Shawnee Backpack Trail offers 50 miles of remote hiking and camping. Spring wildflowers and migrating birds adorn the forest floor and treetops in the spring. Beaver can be seen at dusk on and around the lakes. Fall affords an amazing blaze of color with the tree diversity in Shawnee and winter offers delightful quiet. Hiking in Shawnee is a peaceful getaway and a great place to enjoy native plants and animals. Two species of venomous snakes, the northern copperhead and the endangered timber rattlesnake, occur in Shawnee but are no significant danger to hikers if basic precautions are observed. 2 ! â â ââ â â â â ââ 3ââ ! â ââ 4 â! _ ! ! 5 j ! OHIO DEPARTMENT OF NATURAL RESOURCES 2045 Morse Rd. Building C-4, Columbus, OH 43229 (614) 265-6561 • ohiostateparks@dnr.state.oh.us Twin Leaf Trail – 2 miles The Twin Leaf Trail at Whipple State Nature Preserve climbs and then follows a narrow, wooded ridgetop pocketed with small sinkholes. The ridgetop and head of the valley are bordered by dolomite cliffs of 10-30 feet in height. Glimpses of the Ohio River are visible when the foliage is Photo by: Tom Arbour not too heavy. One of the southern-most preserves in Ohio, Whipple boasts an early display of spring ephemeral wildflowers. For the best wildflower displays, follow the trail down the eastern side of the ridge to the rich woodland below. Three species of trillium, fabulous displays of bluebells, dwarf larkspur and bishop’s cap make this trail especially popular in spring. This preserve is dedicated in honor of Robert A. Whipple, who generously gave this land to the Division of Natural Areas and Preserve in 1989. Shoulder-parking only is available on the east side of State Route 247. Use caution.